The Miami Trace/Great Oaks FFA Chapter has kicked off the school year by competing in numerous career development events. These Career Development Events or CDEs are designed to provide real-world application to classroom contents as well as give students experience in a variety of agriculture career fields. During the fall, FFA members have the opportunity to compete in the Forestry CDE, Urban Soils and Agricultural Soils CDE. 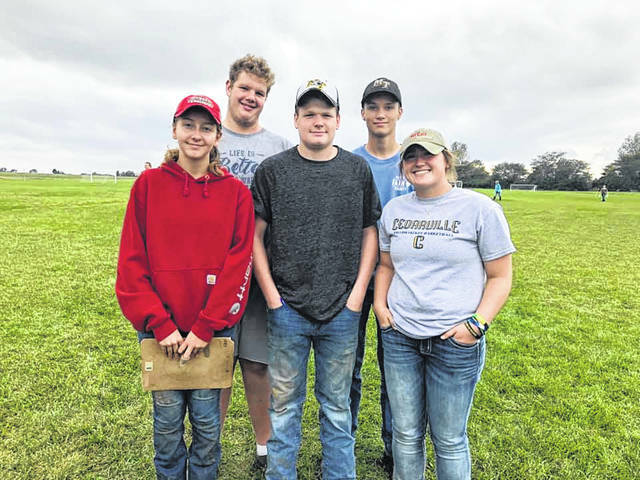 On Saturday, Sept. 29, four members from the chapter went to Hocking College to compete in the State Forestry Contest. These members were Jake Harris, Ben Speakman, Grant DeBruin and Wyatt Atley. As a team, they finished 17th out of the 36 teams competing. The Forestry CDE includes numerous components such as: identifying tree species, evaluating value of live trees, scouting timber stands, identifying forestry equipment, tree problems/diseases and wood products. This year there was also a compass reading and map interpretation part of the competition. In addition to gaining knowledge in the forest industry, members also had the opportunity to tour Hocking College and meet with a college recruiter. On Tuesday, Oct. 2, five members competed in the District Soils competition that was hosted at the Fayette County YMCA. These members were Kyler Batson, Grant DeBruin, Aubrey Schwartz, Logan Smith and Lahni Stachler. In the soils competition, there is an urban team and an ag team. These members are evaluating given plots of land to determine land and soil characteristics as well as make recommendations as to the capabilities of production those land plots possess. During the course of the competition, members must determine the slope of the land, perform ribbon tests to determine soil texture, as well as going into a pit to observe the soil profile and observations about plant life, water table level and soil horizons. All of these observations are recorded and students make recommendations as to the capability of the given plot of land. Miami Trace worked cooperatively with the Fayette Soil and Water office to host the Soils CDE contest in Fayette County. Overall, there were approximately 200 FFA members from Fayette and surrounding counties present for the competition. By participating in Career Development Events, these members are gaining valuable critical thinking and problem-solving skills as well as critical contests in a vast array of agricultural subject areas.